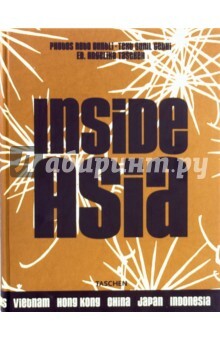 Inside AfricaInside Asia, 2 Vols. Zen. Soothing. Mystical. Meditative. All the most serene words in the world couldn&apos;t begin to describe the effect of Asia&apos;s most beautiful interiors. Whether it&apos;s a temple in Vietnam, a coffee plantation in Java, or a Tadao Ando-designed house in Japan, each interior chosen for this book is remarkable not only for its aesthetics but for its spirit. The book is &quot;clothed&quot; in a silk-like curry-colored fabric adorned with chrysanthemum flowers. These interiors have what it takes to transport you to a sacred place; breathe deeply, delve in, and be inspired. About the editor: Angelika Taschen studied art history and German literature in Heidelberg, gaining her doctorate in 1986. Working for TASCHEN since 1987, she has published numerous titles on art, architecture, photography, design, travel, and lifestyle. About the photographer: Swiss photographer Reto Guntli, based in Zurich, regularly travels the world shooting for international magazines. He has published numerous books and contributed to TASCHEN publications such as Inside Asia, Living in Japan, Living in Bali, Great Escapes Asia and Great Escapes Europe. About the author: Sunil Sethi is a leading journalist, newspaper columnist, and television anchor based in India. His writings have appeared in a variety of publications around the world. Издание на английском, немецком и французском языках.